The Egyptian Embassy in Seoul and its Defense Office marked Egyptian Armed Forces Day on Wednesday. On Oct. 6 each year, Egypt celebrates the October War of 1973, also known as the 1973 Arab-Israeli War or Yom Kippur War. The war began with the Egyptian Army’s crossing of the Suez Canal as part of Operation Badr, which culminated in the capture of the Bar Lev Line, a chain of fortifications built by Israel along the eastern bank of the canal. Noting that “those who have lived through the scourge of war know the value of peace,” the colonel said the victory symbolized the “first brick in a wall of peace that Egypt has sought to complete” against internal and external challenges. “Egypt has committed itself to countering terrorism on behalf of the world,” he said, adding the country has simultaneously chosen a path of development and international cooperation. 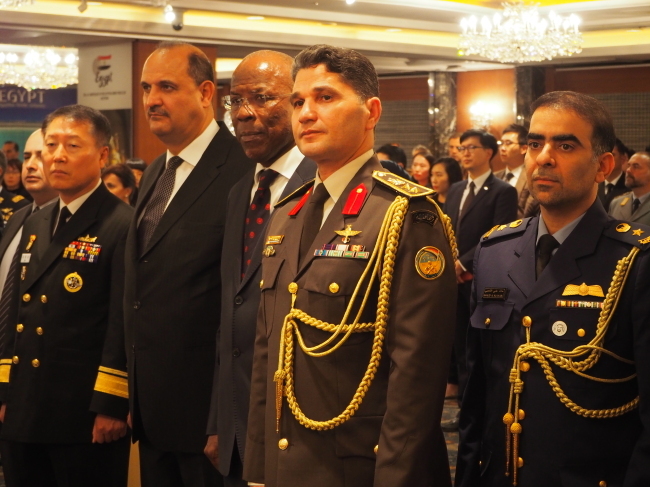 The celebration coincided with the inauguration of the Egyptian Defense Office in Korea. The projects have been implemented with international partners, with Korean companies playing a vital role, he added.